I will confess that my son didn’t wear any type of shoes until he started walking. Not that I didn’t buy them, he just never wore them. But socks were a passion and I did the same thing as you are doing. His socks always matched his outfit. It is very true that you lose a TON of socks on the outings. Heck, my daughter has also lost one Puma shoe (baby) and one Nike shoe (baby) It sucked because the Pumas were her first shoes, so I was sad. 🙁 But it does happen so make sure you are prepared to just shrug it off. (that’s why I NEVEr paid full price for my baby shoes/socks. lol. It’s like when you do laundry and you always come up one sock short. Love those pink boots and the sock shoes. They are so cute. Aw they are so cute! I love baby stuff to – smaller = cuter! Lucas never wore shoes until he started walking at 12 months. I think it might be different with girls though because they are cuter? You have a lot of stuff there! Awwww those SHOES. I used to try and put socks on Nellie’s feet but she was really into kicking them off. Also, I feel your shoe pain. I have a weird, wide spot on both feet and can NOT fit into anything cute, strappy, or remotely attractive without being in massive amounts of pain. One that I have learned is that you can never have too many socks when it comes to babies and toddlers. You are so bound to loose them either in the wash or on an outing, especially when they hit the age where they can take off their own shoes and socks. I can’t tell you how many pairs of socks I’ve purchased from Walmart. It’s crazy. 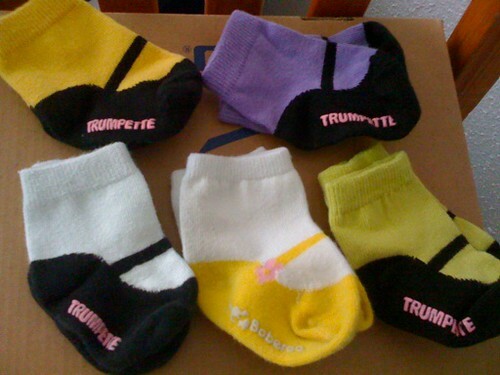 you will LOVE those trumpette socks…mary margaret had TONS. and to get them for $3.50…that is an unbelievable steal–and i’m a consignment sale queen myself! Wow FutureMama, the socks are so cute and the shoes, I would like to have them all. Especially those pinky boots. Little LadyBug is going to look gorgeous more than mummy :)! Wow. I think. THINK you are good in that area now. Great buys are hard to pass up though, I know. Too well. i feel you on hating shoes. i wear a size 11 too and i hate shoe shopping…especially since i almost always have to buy my shoes full price. if i wait till they’re on sale, they won’t have my size anymore. booo for clown shoes. but those socks are adorable! Too cute!! Love the pink boots, what a great deal! Love it. Her feet are going to be so cute and color coordinated. Babies feet are the best. I love those socks!! They are super cute!!! The baby socks are going to drive you insane! I still cant find a pair that my kids will keep on their feet! Especially before the age of a year old. I love the Robeez though, that is all we really use in the house. My oldest turned 2 in December, and he is just starting to be interested in shoes with actual real sole’s on them. And that is only because Cars (Lightening McQueen) is on them. Pediatrician loves them though because it doesn’t cause any problems with their feet from being forced into certain positions at a young age. Robeez are awesome! They are the only shoes my daughter doesn’t rip off plus they are super cute! Even though I am not pregnant( I hope I do get pregnant this month) and don’t have any children I have a strong urge to go out and buy those shoe socks. They are super cute! I love Robeez! They are my daughters favorite shoes.. ie. the only ones that will stay on her feet. Lots of socks it a good thing. Wow! You are so ready for this baby! She is so lucky, I don’t think I ever bought her shoes while I was pregnant! We love Stride Rite shoes. oooh i love the little pink boots! Never enough socks! I will probably spend an hour today with a big basket of the kids socks I’ve collected around the house and try to match them up. Lil’Bit (my 1 yr old) hates socks, and will take them off and throw them at every chance she gets. Da Boy (my son) will hide socks under things and my 8 yr old just doesn’t know how to get things in the hamper and I find them under her bed, or in the bathroom. So, no – never enough socks! 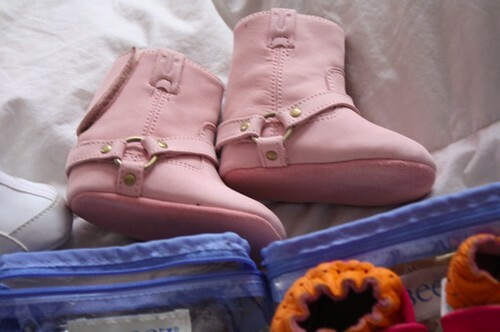 and OMG, those pink boots are ADORABLE!! Those little boots are adorable! I love shoes, but I hardly ever wear them. I like to go barefoot. I bought a lot of shoes for my daughter when she was an infant, we lost a lot of them, usually just one of the pair. I love the sock idea. Happy SITS Saturday Sharefest! Those are some ADORABLE finds! I think JDaniel has more shoes than I do. Stopping by from SITS! What cute shoes and socks. I love shoes and your blog. Such cute finds!! Good call on shopping consignment—Logan’s almost one and a half, and I’ve never gotten around to it!